Pervious Concrete is a special type of concrete that allows water to pass through it, reducing the runoff from a site and surrounding areas. It is made with little or no fine aggregate, and is mainly used for pavements to allow the penetration of surface water through the concrete. A large void content, approximately 15%, allows rain and runoff to penetrate through the pavement directly into the soil. This process recharges the water table and reduces storm runoff, which might otherwise contaminate the ocean and impact storm water systems. Pervious Concrete also reduces the chances of flooding, by dispersing surface water into the ground. Placing this type of concrete is very laborious and can require compaction. Most of the interest in this product comes from areas where building codes allow incentives for using a permeable pavement. Pervious Concrete offers several advantages: groundwater is recharged, water resources are preserved, storm water runoff is reduced, and storm water quality is improved. 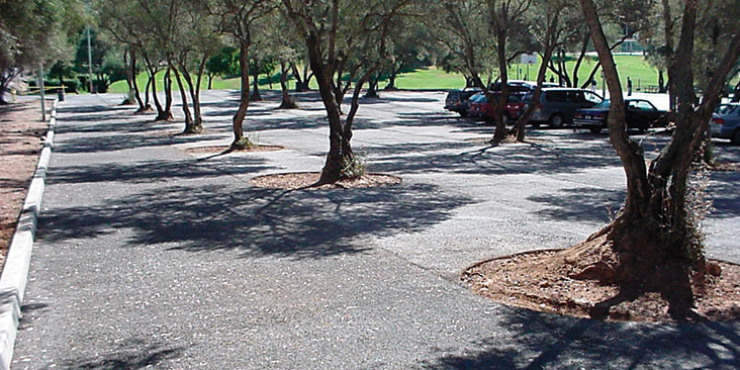 Pervious Concrete is considered a green product and can qualify for LEED credits.